In 2014 the Commonwealth Office of Learning and Teaching (OLT) commissioned AHRECS to undertake work to help OLT grant-holders and fellows avoid unnecessary difficulties and delays during research ethics review. the absence of resources relating to the ethical design and review of Scholarship of Teaching and Learning research. 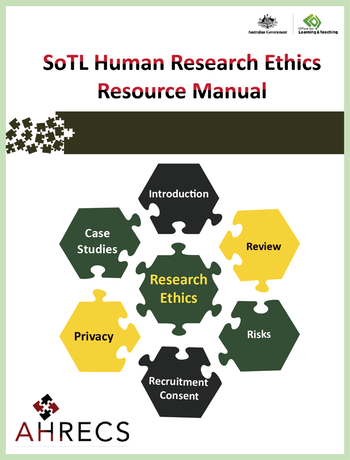 The OLT contracted AHRECS to produce a resource manual to support the ethical decision making of the researchers that it funded. It also wanted to assist other SoTL researchers and research ethics reviewers with the ethical review of SoTL research. The AHRECS SoTL Manual is comprised of six complementary booklets that include academic references, recommended reading and prompts for ethical reflections. The booklets are practically focused and include example problems/suggested strategies. The Manual is available from the OLT web site, and a copy is hosted on the AHRECS site below. The SoTL Manual applies, references and complements the University Research Ethics Manual commercialised by Griffith University. It is however possible to use the SoTL Manual without purchasing a UREM license. The six booklets of the SoTL Manual are provided here as *.docx on an open license basis for use by researchers, research ethics reviewers, research office staff, and institutions. If you want to use more than one paragraph of text from the SoTL Manual (e.g. as the basis of a new resource), we ask you to cite the SoTL Manual as a source including the fact that the SoTL Manual was commissioned by the OLT and produced by AHRECS. Allen, G, Israel, M and Thomson, C (2016) Scholarship of Teaching and Learning Human Research Ethics Resource Manual. Sydney: Australian Government Office for Learning and Teaching. Please direct any questions about the SoTL Manual or the UREM to Dr Gary Allen (gary@ahrecs.com). You can find out more about the work of AHRECS at www.ahrecs.com. Please note that we have found that sometimes links from Word documents to our web site can return an error. This is an intermittent bug, all six booklets are on the AHRECS site, and the links are correct.